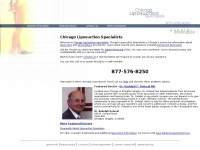 Welcome to Chicago Liposuction specialists. Chicago Liposuction Specialists is Chicago's source for	information about liposuction and liposculpture procedures. Learn about new fat loss advances including tumescent liposuction. The web server used by Chicagoliposuctionsurgery.net is located near the city of Ann Arbor, USA and is run by Merit Network. 20 other websites are located on this web server. Most of them are provided in the english language. The websites of Chicagoliposuctionsurgery.net are hosted by a Microsoft-IIS server and were developed in the programming language ASP.NET. The visitor analysis software Google Analytics is used to analyze the visitors of the websites. The website does not specify details about the inclusion of its content in search engines. For this reason the content will be included by search engines.